The Consumer Price Index (CPI) rose 2.5% on a year-over-year basis in June, following a 2.2% increase in May. This is the largest year-over-year increase in the CPI since February 2012. This month's year-over-year CPI increase follows a year of gradual acceleration in consumer price inflation, from a recent low of 1.0% year over year in June 2017. This trend reflects increases in prices for gasoline and food purchased from restaurants, as well as offsetting factors such as lower price inflation for electricity and telephone services. These movements coincide with recent improvements in the economy and the labour market, as well as an increase in oil prices. Seven of eight major components rose year over year. The transportation index (+6.6%) was the largest contributor to the year-over-year increase, while the household operations, furnishings and equipment index (-0.1%) was the lone major component to decline. Energy costs were 12.4% higher compared with June 2017, after increasing 11.6% year over year in May. 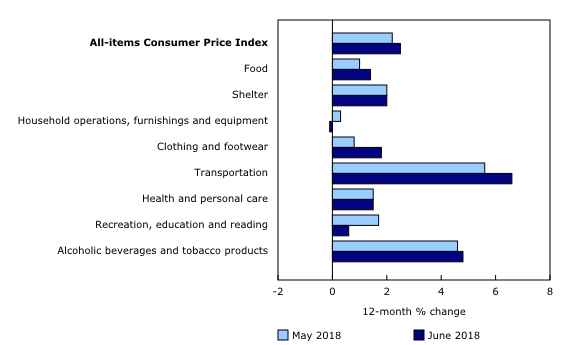 Year-over-year gains in prices for gasoline (+24.6%) and fuel oil and other fuels (+25.9%) were larger in June than in May, as sustained increases in crude oil prices and exchange rate pressures continued to impact consumer prices. Prices for durable goods rose 0.6% year over year, led by growth in the purchase of passenger vehicles index (+1.8%). This gain is attributable to lower rebates on 2019 model-year vehicles. 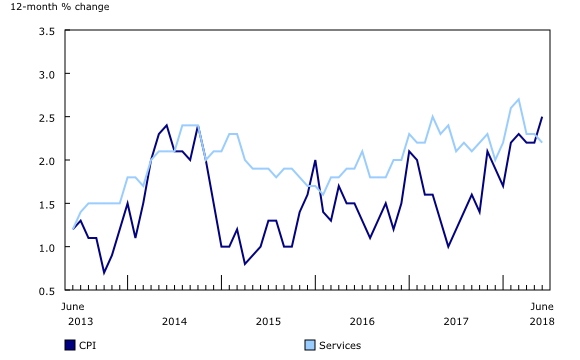 Year-over-year gains in the price of services were lower in June (+2.2%) than in May (+2.3%), moderating the growth in the CPI. Prices for telephone services (-8.8%) continued to decline year over year, amid a series of industry-wide price promotions. Consumers paid 8.4% less for travel tours compared with June 2017. The homeowners' replacement cost index increased less on a year-over-year basis in June (+1.4%) than in May (+2.0%). 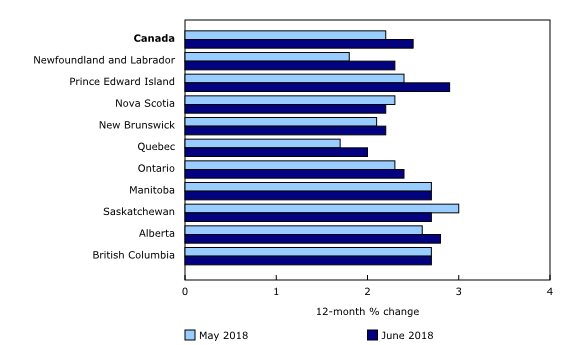 Prices rose more in six provinces in June on a year-over-year basis compared with the previous month. This growth was strongest in Prince Edward Island, where prices increased 2.9%. 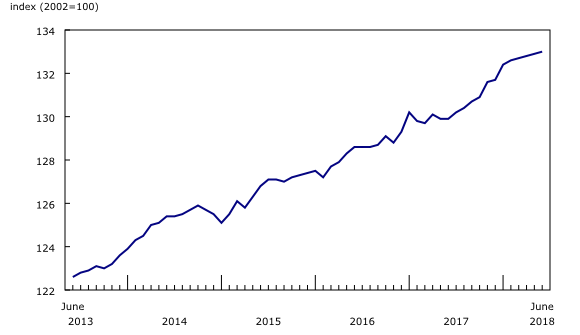 The CPI in Newfoundland and Labrador rose 2.3% in June. Gasoline prices were up 16.5% in the 12 months to June after increasing 5.5% the previous month. On a seasonally adjusted monthly basis, the CPI rose 0.1% in June, matching the increase in May. Six of eight major components increased, while the household operations, furnishings and equipment index (-0.3%) and the recreation, education and reading index (-0.6%) both declined. With this release, data on inter-city indexes of price differentials of consumer goods and services, appearing in table 18-10-0003-01, have been updated to October 2017. As well, the geographic strata "Whitehorse, Yukon" and "Yellowknife, Northwest Territories" have been introduced into the table, reflecting data for the all-items index and its eight major components and selected sub-groups. Real-time data table 18-10-0259-01 will be updated on August 7. The Consumer Price Index for July will be released on August 17.